WP Super Cache can help optimize your WordPress website. WP Super Cache will enable your website to load faster and use less server resources. 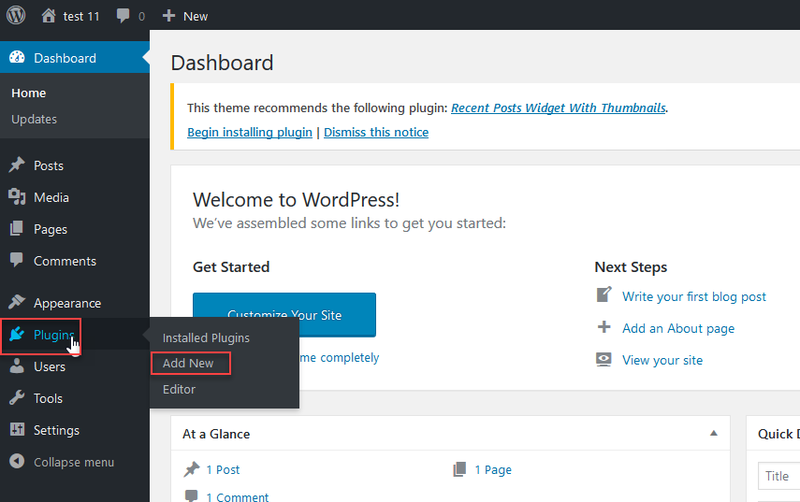 You can install WP Super Cache by first logging into your WordPress Dashboard. 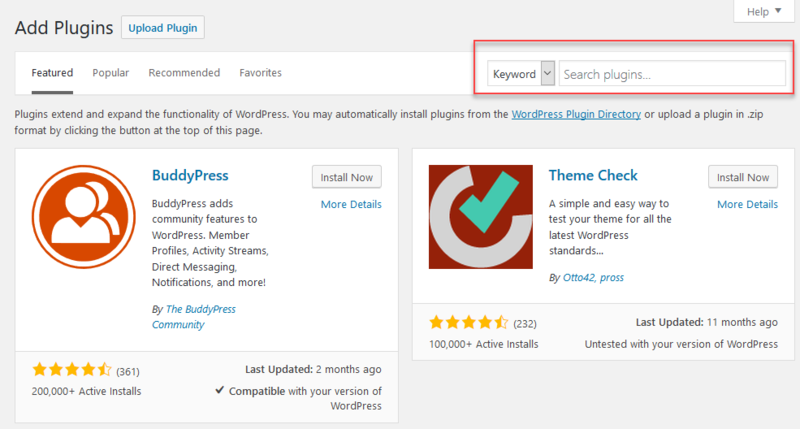 Once you have logged into your WordPress Dashboard, click on Plugins on the left menu pane. Then click Add New. Use the search box, and search for "super cache". 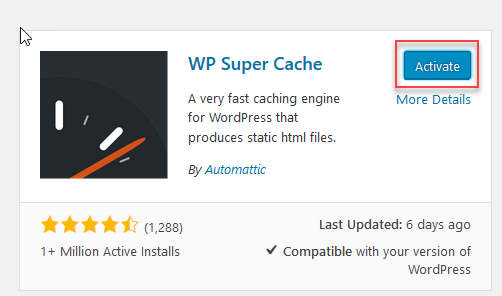 After the search is finished, you should see the plugin named WP Super Cache made by Automattic. Click on the button labeled Install Now. Once the plugin installation is complete, click on the button labeled Activate. You will see warning with the title "WP Super Cache Warning!" Make sure to read through the warning. Follow the directions if necessary. Note that these directions were written for using the simple caching options. Therefore, you may want to consider moving the cache directory as they recommend. If you require assistance with moving the directory, please contact our live technical support team as they can help direct you via phone/chat/email. 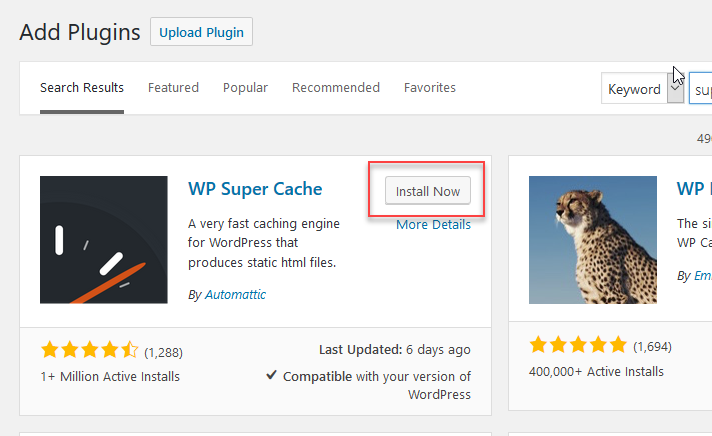 If you are installing WP Super Cache for the first time, then click on the Dismiss link. Otherwise, click on Logout. Note that if you do not click on the Dismiss or Logout options, then you will see the warning appear at the top of the page for WP Super Cache Settings. Click on the link labeled plugin admin page in order to enable caching. You will be on the tab labeled Easy. Enable simple caching by selecting the Caching On and then Update Status. Note: Easy (Simple) caching will only improve performance on WordPress hosting and VPS/Dedicated servers with PHP-FastCGI Process Manager (PHP-FPM) installed. Simple caching has no effect on VPS/Dedicated servers without PHP-FPM and shared servers as SuPHP doesn't have server-side caching. For VPS/Dedicated servers without PHP-FPM and shared servers, select the Advanced tab, Enable Caching checkbox, and then Expert. Pressing Update Status will make Mod rewrite changes in the website .htaccess file, shown in green afterwards. You may want to make a backup of the file beforehand. 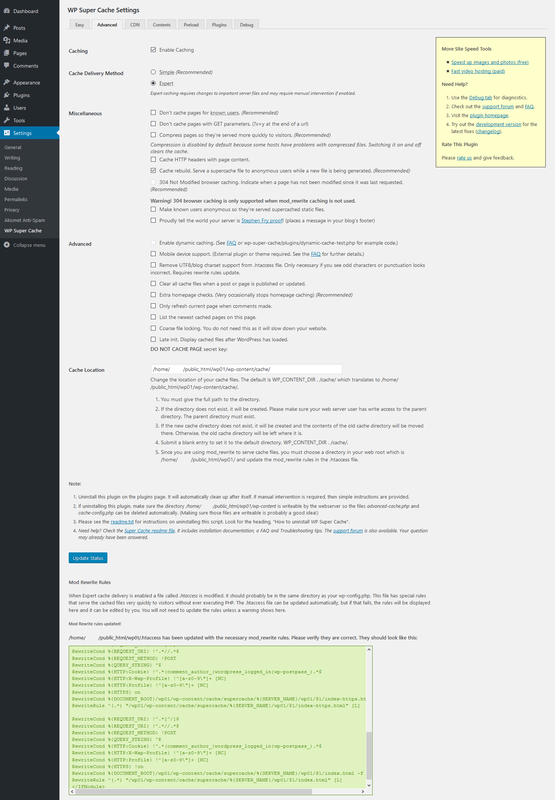 At this point, the simple caching option for WP Super Cache has been enabled. Please check the next article on Optimizing WordPress with W3 Total Cache plugin. If you missed our previous article, please see the Plugins for Advertising tutorial. For more information on this course please visit Recommended Plugins. now the plugin default is "Use PHP to serve cache files. (Recommended)". does IMH want to update this post or should we continue with "Use mod_rewrite to serve cache files." i was using W3 but i needed iQ Block Country which is compatible with super cache. haven't used gtmetrix in years, used to have A B C now i try 5 sites which get D C. they say they changed to full load. shouldn't a typical wordpress site get better scoring? thank you! Sorry for the issue with the plugin changes. This article does need to be updated. I've been asked to put a note in our list of articles that need to be updated. The article will be changed as time (and a priority) permits. You may want to review the latest comparisons in caching to see if another solution works better. So... W3 Super Cache or W3 Total Cache - there are articles for enabling each of these on inmotionhosting.com; do you recommend we use BOTH? They both work similarly, and they are both popular, but we recommend choosing one over the other depending on your preference or which one works better for you. Thank you for this article. Very, very helpful. Question: should I also check the other two "recommended" boxes" ??? Those options improve the performance of the site slightly, so you certainly can select them. They are not a huge difference, so you may also get away with not selecting them if you wish. Thank you for the reply, Scott. I certainly appreciate the advice. I think I figured it out. Instead of going to my actual website page to check if the cache worked using the view source code, I tried it while I was still on a dashboard page. When this occured to me, I went to my website, clicked on the home page and hit view source code and the message about the caching was at the bottom. Hi I tried to check whether the changes suggested using the View Page Source. I checked at the end of the pop up page and didn't see what you say I should above. In looking at the WP Super Cached page, there is a button that says TEST cAChe which clicked and it said that the test was successful. Does this mean that the changes that i did are working or do I have to try the second method to check that is suggested above. Thank you for contacting us. I was unable to find any documentation on the built in "cache tester" so I can't confirm its accuracy. I did see people looking for help due to failed tests. I followed the guide with a new installation of WordPress, and it does add the stamp to the bottom as described above. You may have to clear your browser cache before testing. The official FAQ for WP-Super Cache provides additional tips for testing if your blog is being cached. I am a current InMotion customer using WordPress. I started using this plugin and set it up just as recommended step by step and it's working. Around the same time I started having some trouble with my front page showing without some of its formatting and in full page view without its sidebar. When you'd click on a post listed there it would show with everything the way it should be. I tested plugins by shutting them off and on but couldn't pinpoint the problem. The front page may start downloading as a zip file. The wrong page is occasionally cached as the front page if your blog uses a static front page and the permalink structure is /%category%/%postname%/. I’m 99% certain that they aren’t bugs in WP Super Cache and they only happen in very rare cases but you can run a simple check once every 5 minutes to verify that your site is ok if you’re worried. You will be emailed if there is a problem." This sounds like it might be the problem I am having. Does anyone know this plugin well enough to know if there is some way to configure it if you're having this problem. I have been reading in the Wordpress forums, and plugin forums, but I can't find anything. Usually, issues like this are due to caching in which clearing your browser cache should allow the page to show exactly as you have set it up. Could you provide me with the exact site that you are having trouble with to see if I can replicate the issue? Yes, thanks, the site is the one mentioned above peterdmallett.com I was trying to figure it out a good part of the day yesterday and cleared the browser several times trying it out on different browsers as well. Although at that time I had no idea what the problem might be. It looks like your site is displaying as if it were viewed in a mobile browser. Are you using any plugins that could interfere with your layout? About Me widget, comment luv, HC-Custom wp-Admin url, Jetpack, Limit Log-in Atempts, PC Hide Pages, Revive Old Posts (which had a recent update) Wordpress CEO, WP-Spam Sheild, WP Mailto Links-manage email links, WP-Super Cache, and Shareaholic. I also use a find and replace plugin and click to tweet that I turn on only when I need it. I'm trying not to have too many plugins. I appreciate any suggestions, I wasn't expecting such quick responses. I'm not currently seeing the issue on your site that you've described so it's a bit hard to guess at exactly what might be going wrong. If you're still seeing the issue after clearing your local browser cache, you might also want to clear the WordPress cache in WP Super Cache by going to Settings > WP Super Cache then clicking on Delete Cache. If you're still having issues, you could try to disable all your other plugins and then re-enable them one at a time till you find a culprit. Or you might also be interested in giving the W3 Total Cache plugin a try instead and see if that is also giving you issues. Please let us know if you have any further questions at all. Hi Jacob, I believe you solved the problem I was having. The last two items I did not have checked. I checked them and everything on the home and other pages seems to be working correctly now. Thanks for also letting me know about how to clear the Super Cache if needed. Much appreciated. Awesome, glad that seems to be working for you! If you continue to have issues like I said you might want to give W3 Total Cache a look as it's a more robust caching plugin and might not encounter the same problems, but hopefully with these new settings WP Super Cache will do the trick for you! Sorry that you're having problems with the Super Cache settings. If you click on each of the items in the GT metrix report, you get a break down and explanation about each reported item. Your page is quite simply loading a A LOT of items (20 MB +), so it's going to be a little hard to improve the score. There are advanced settings in the WP Super Cache program that you can set, but you're going to need to become more familiar with using the caching tool. Here's a more complete tutorial for making optimal settings in WP SuperCache. You should be able find some optimization improvements between that tutorial and the information that Gtmetrix gives you. Please understand though, that sometimes the best way to optimize a large site is by breaking down how much you are presenting at one time. Your site gets a 'B' on the GTmetrix page speed report at this point, and that really is not bad. I also checked it on my iPad mini and it appears to take a little time -but only because it's trying load up the many pictures that you have showing on the front page. Hope that helps to give you some information on improving the optimization for your site. Can someone help me look into WHY my site is still failing with the GTMetrix report ? I installed WP Super Cache and followed these instuctions and its working, says so on the bottom of my webpage like you said...but I am still failing on report.